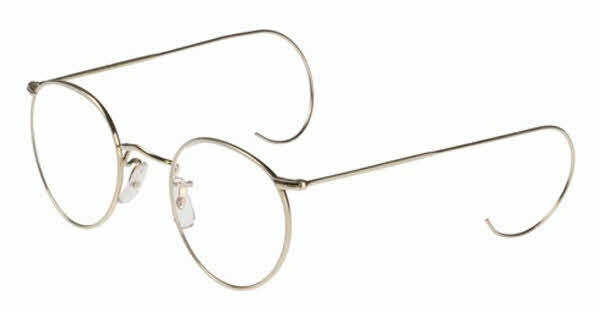 The iconic Savile Row Panto Eyeglasses with Cable Temples are one of the most recognizable frames in the world today. Every pair of Savile Row glasses is crafted from 18kt rolled gold and finished in either a 18kt gold or rhodium (silver color) plating. This frame comes with Cable Temples, for added comfort and hold. The cable temples are a sophisticated and functional choice. Perfect for Single vision or Progressive prescriptions. These Savile Row Panto Eyeglasses with Cable Temples have been seen in countless films throughout the years. Worn by Geoffrey Rush with chestnut rim in the film The King's Speech as well as Ralph Lauren in his everyday life. Savile Row 18K Panto - Cable Temples eyeglasses come with a cleaning cloth and protective carrying case. FramesDirect.com is the only authorized online dealer of Savile Row eyewear in the USA. The first ones looked so good I bought another.. This is the second pair of the Saville Row glasses that I purchased. I bought the first pair about 20 years ago from a local optician. With the discounted price that I paid through Frames Direct, the second pair cost about the same as the first; however, that was 20 years later. The first pair was gold color while the second was chrome. After about 15 years, the first pair became weak where the cables met the temples. I sent that pair to a repair shop in Baltimore and had the weld re-enforced. The Saville Row glasses are extremely comfortable. I am a researcher who reads constantly. The large eyeglass surface gives me excellent sight. At first, I did not like the square edges of the frames, but over time, I have grown to like the frames. These are very high quality frames and well worth the cost. Frames Direct gave me regular updates on the special order and delivered the frames on time. I highly recommend Frames Direct as a very professional organization. I've had my new glasses for a couple of weeks now. They are perfect for me. As soon as I am able, I will be buying another pair from here. FRAMESDIRECT.com was very pleasant and professional when it came to processing my order. They kept me informed during their processing. Being my first time to order glasses online, I was a bit uneasy. FRAMESDIRECT.com delivered and made it easy with no problems. The Savile Row Panto frames are even better than I had expected. After discussing the fit and style with a FramesDirect.com representative. I placed my order. When they arrived I could see and feel the difference in the quality. The fit was perfect and I have received many compliments on them. I highly recommend them.